from an outwardly serene Atlantic Ocean. as ray upon ray ignite in flame and seafoam. the waves both to my left and there before me. we then return to sea. but the way of light is surrendering to the absolute’s intent. Enlightening intent to know itself comes into being. Universal being is evolving in complexities of mind. to be the silent seeing intent on seeing itself. Nothing in this process is unnecessary. Everything is moving at the speed of that enlightenment. but the absolute is never absolutely speaking. as twenty birders grabbed exclusive pictures. to acquisition all that precious silence? including ones one only sees through Hubble’s eye. and trees and all the universe is what I really am. is actually within my silent seeing. my unknowable and infinite awareness. Right now, I’m here alive. this life will never know I’m dead. should I concern myself with dying? while the trees prepare for spring. I process light to know the light. I had always wanted to drive cross-country. Maybe it was Chris who forty years ago first put desire in my eyes to see this land as she discussed her trips back and forth from San Diego. Instead I studied all about its history and literature looking for the sights as others saw them. Six years ago, my daughter was about to move to California, and being recently unemployed, I decided I should drive her there, and then I’d slowly circle myself home, visiting the natural wonders of America. And so it happened. I wrote a poem while sitting on a great sequoia; took so many pictures in Yosemite they left me black and white; looked out upon Lake Tahoe’s mountain dark reflections; drove the lonesome road straight through the desert of Nevada; walked through sandstone Arches after crying at the marriage of the ground and sky in Canyonlands; looked out from Anasazi windows in the sacred vaults of Mesa Verde; never took a photo of an inexplicable white buffalo in Zuni; worshipped with the silent Acoma apparitions in Sky City; just missed a slow coyote on I-40 in New Mexico; touched the surface of the largest mass of turquoise ever while exploring Santa Fe; listened to the blessed myths of Taos Pueblo; found my way to Cripple Creek and finally the summit of Pike’s Peak from where I scouted over cornfields of Nebraska crossing Mississippi waters towards the east back home. It was experience I cherish to this day. But still, it was the mere experience of a superficial world, infinite in its variety and wondrous in its manifest appearances, but nothing without the consciousness in which it’s seen. This wordless Being is the only wonder of the universe. More to the point, it is the god in which that universe appears. It’s here and now, and everywhere I go, it is. Even nowhere. Omnipotens sempiterne Deus qui abundantia. This land is your land. as a universal entity not knowing nodes aren't separate networks. We know beneath the surface is an energetic field of sub-atomic spontaneity. We know that it’s impossible to see the space between the mother and her child in which a separate consciousness is born. We know that nothing is an island and the butterfly that flaps its wings becomes the eye of hurricanes. It’s elementary education most of us received some years ago. And yet we play this game of long division to the point of wondering why this world is so divided, full of suffering and violence. Spontaneous, unborn, holistic, we pretend we’re something other. Happy birthday to this grand illusion. At last, the sun will set a minute later on this evening. we tend to grab at what we can. that helps to fill the gap we intuitively know exists. and nonexistent on the very same occasion. Similarly, the sun is never really setting. Its light is ever-present, omnipotent and diamond bright. It’s just the world that’s in the way. If it’s not experiential, it’s a borrowed belief. Beliefs may be borrowed for a limited time on faith. If a belief is not confirmed by one’s experience, return it. If a belief is confirmed by one’s experience, burn it. an epiphenomenon of the brain. in, of, and by consciousness. at least the sun appears to circle the earth. But the earth circles the sun. And the sun appears in consciousness. The flower doesn’t grow itself. It takes a seed to raise the stem. how would the root appear? and who will taste its truth? despite a battle’s latest lie. because she never has to fight. All are always hailing love! is singing in her laurels. This is revelation of a native kind. and I am the eye of the universe. These words are what I see. The space around me is a waterfall. a fearless dragon swallowing its tail. and all is my intent to see myself. with this poem, all disappears. Rather let us form them for you. Thought itself as its own mother. Even though it isn’t yours. Close your windows! Close your doors! Truth is nothing but a thief. What remains when it takes all? Who is left to smart and die? Never question who am I! Always fall for our free fall. Never freeing your own being. Stop them now and start your drinking. 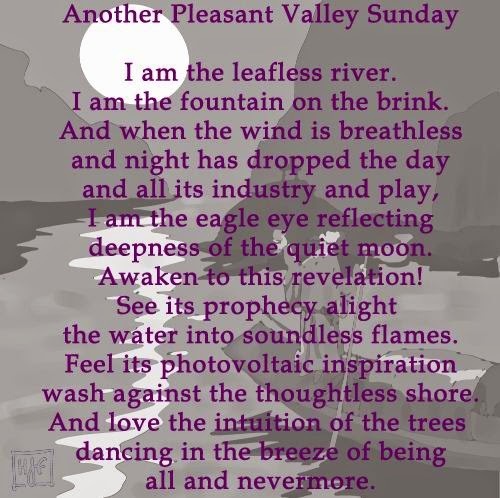 I am the leafless river. I am the fountain on the brink. deepness of the quiet moon. the water into soundless flames. wash against a thoughtless shore. I was shy at school and during recess stood alone, standing up against a chain link fence, while I watched the schoolyard buzzing with its games of tag or jumping rope or shouting, chanting, laughing, crying, talking. Inside I knew I didn’t have to be that way. One day, weeks after classroom pictures had been taken, we received a captivating envelope. Inside, besides our five-by-sevens, eight-by-tens, and wallet sized individuals, there shone a wondrous sheet with all the separate photos of my classmates smiling through. My mother cut the universal glossy into personal existent images and I played with them while sitting on the floor, pretending we were in that busy schoolyard and I was nothing but the center of attention, playing childhood games and being infinitely happy. Although, there were those times just two of us, me and Joanne Kerry, secreted ourselves away and climbed the coffee table, hand-in-hand, or rather edge-to-edge, and rested by a plastic apple in an emerald crystal bowl, whispering chromatics of our love for love. In that moment, I would disappear, both physically and descriptively. What remained is now transmitting clouded memories some fifty-four years later—as if I never aged. In truth I see that consciousness was never born, and life is just this lesson trying to be learned. The polar vortex visited last week. who worshipped at the feet of a perfect future. She shall have disbelieved her universe! below our tender surface. Her fame is unknown. I will have changed my name if I were her. beclouded will have been always open sky. Questioner: As I listen to you I find that it is useless to ask you questions. Whatever the question, you invariably turn it upon itself and bring me to the basic fact that I am living in an illusion of my own making and that reality is inexpressible in words. Words merely add to the confusion and the only wise course is the silent search within. Maharaj: After all, it is the mind that creates illusion and it is the mind that gets free of it. Words may aggravate illusion, words may also help dispel it. There is nothing wrong in repeating the same truth again and again until it becomes reality. Mother's work is not over with the birth of the child. She feeds it day after day, year after year until it needs her no longer. People need hearing words, until facts speak to them louder than words. Q: So we are children to be fed on words? M: As long as you give importance to words, you are children. Q: All right, then be our mother. M: Where was the child before it was born? Was it not with the mother? Because it was already with the mother it could be born. Q: Surely, the mother did not carry the child when she was a child herself. M: Potentially, she was the mother. Go beyond the illusion of time. Q: Your answer is always the same. A kind of clockwork which strikes the same hours again and again. M: It can not be helped. Just like the one sun is reflected in a billion dew drops, so is the timeless endlessly repeated. When l repeat: 'I am, I am', I merely assert and reassert an ever-present fact. You get tired of my words because you do not see the living truth behind them. Contact it and you will find the full meaning of words and of silence—both. inside the sun it is to be.